LANCASTER, CA--(Marketwire - December 30, 2010) - Beautiful Earth Group (BE), a leading developer of clean energy generation facilities and technology, began construction this week on its Del Sur Solar power plant in California's Antelope Valley. The project is the latest venture by the New York-based clean energy company and will be the largest solar facility within the City of Lancaster when completed. Del Sur Solar comprises two utility-scale solar generation facilities. Each 19-megawatt (MW) photovoltaic (PV) plant is expected to generate more than 16 gigawatt-hours of electricity per year, enough energy to power over 10,000 homes. The project is located on just over 187 acres. In keeping with the company's strict siting criteria, Del Sur Solar is located on previously disturbed agricultural land, significantly reducing potential impacts to the environment. The site is immediately adjacent to a Southern California Edison (SCE) substation, which all but eliminates the need for new transmission lines. In addition, Del Sur Solar's power generation technology requires no water to produce power, preserving the region's precious water resources for other important uses. "Beautiful Earth prides itself on leading the way as the cleanest, greenest solar power developer," noted BE President and CEO Lex Heslin. "Del Sur Solar represents the culmination of extensive evaluation on hundreds of potential sites in California. We were excited to purchase this prime site in a city that values environmentally sensitive businesses and in an area with one of the best solar resources in the United States." 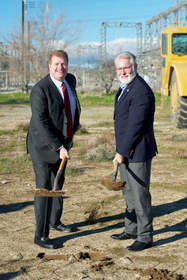 Lancaster Mayor Rex R. Parris was on hand to celebrate the project's groundbreaking. Parris said, "The City of Lancaster welcomes Beautiful Earth Group as a partner in our green initiatives. We are pleased to be the site of choice for this project. Del Sur Solar brings Lancaster one step closer toward the goal of becoming the alternative energy capital of the world. We are confident this is the first of many joint projects between the City and Beautiful Earth, which will contribute to a greener City, a greener California and a greener nation." The company looks forward to providing the energy to California's utilities to meet the State's renewable energy goals. Power Purchase Agreements (PPA's) are being finalized, and interconnection applications have been filed with Southern California Edison (SCE) and the California ISO. Beautiful Earth's long term goals are focused not only on increasing the supply of clean energy to the world however. Heslin asks consumers to consider "If a product is not made with green energy, is it really green?" Heslin feels that it is BE's responsibility to teach the public how to differentiate what really is "clean and green" and increasingly, to have manufacturers use "Beautiful Energy™" rather than "dirty energy" to make truly green products. Founded in 2008, Beautiful Earth Group is a privately funded firm investing exclusively in clean energy generation and technology. BE's projects rely on creative planning and siting, advanced and commercially proven technologies, construction and integration by experienced engineering, procurement and construction contractors, and the sale of its product through long-term power purchase agreements or feed-in tariffs. With its focus, flexible approach and ability to fund the early stages of its growth internally, BE is uniquely positioned to meet the world's growing demand for sustainable infrastructure. Beautiful Earth Group is headquartered in New York City, New York, with offices in Newport Beach, California and Tokyo, Japan. For more information please visit www.beautifulearthgroup.com.